Just… wow. Here is one shred guitar album I’ve been wanting to hear for quite a long time; something full of instrumental tracks that not only do well without vocals but really keep me 100% hooked for the entire duration of the CD. Mad Guitar Records have had an advantage here in being able to choose the best tracks from a whole host of different artists, but that doesn’t take anything away from their achievement. A careful selection of artists and tracks that blend well together and an ordering that makes the change in artist behind the track seem almost seamless, for me they’ve nailed what it takes to become the definitive shred compilation CD. There are so many tracks (17 in total), discussing each one in limited detail would be a pointless exercise so I’ll try discuss the general vibe of the album and the production qualities, with a few mentions of tracks that really stood out. Production on the CD is top notch, inside and out. From the perfect packaging courtesy of MGR, to the clean, well audible and not over compressed mastering, everything about the CD screams “big budget”, which is quite unusual in our small shred guitar niche and a pleasant surprise to see this. The fact that so many artists have collaborated on it doesn’t show, and the standard in sound quality is not only consistent but congruent throughout the album. If I had to describe a general musical theme as emerging from the CD, I’d say its a very forward focused shred album that doesn’t dwell too long in showing off technique or replicating famous styles of the past. You won’t find anyone trying to imitate Yngwie Malmsteen on the CD, on the contrary, all the musicians featured have either focused on creating their own style, or merging virtuoso guitar with upbeat ‘pop’ sounding compositions to good effect. The word melodic is key here, if you love melodic rock or melodic guitar playing, etc, you will love this album. One of the most notable tracks is ‘Epic‘, which as the title describes, is a track of epic proportions. The guitar playing courtesy of Mr. Fastfinger, is slick, distinctive, original and highly melodic, and the composition is fantastic; already I would call this one of my favourite shred guitar tracks of all time (and that’s not something I’d put in print carelessly). About a third of the album’s tracks are unreleased, and one of the most original of these is ED To Shred’s ‘Finding The Edge‘. It uses what sounds like a talkbox in the riffing guitar sections quite creatively, and it makes great listening. Even Roo from Mad Guitar Records makes an appearance on the album himself with his track ‘Heat‘, an upbeat melodic track with a superb use of fluid legato guitar in both writing catchy hooks and also impressively fast fills. You may have noticed Shredaholic favourites Scott Allen and Rick Graham are on the album, with Scott supplying one of his best tracks from the album “What Lies Beyond Words”, and Rick contributing a brand new track that’s quite frankly, stunning – I’ve heard a lot of Rick’s work and this is his best to date. It feels unfair that I’ve not mentioned every artist by name, as they certainly deserve it – every single track on this album is undoubtedly one each artist must be particularly proud of, as they’re all just so damn good! Of the artists I’d personally never heard of before listening to Melodic Soloists, you can guarantee I’ll be trying to find out more about them this month. I’d actually go as far to say that if you’re visiting Shredaholic.com, then there’s a really high chance this is the perfect album for you. 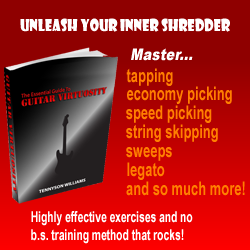 There is such a range of different accomplished shred guitarists on here, and different musical styles, that if you can’t find a few tracks you like then maybe you aren’t a fan of shred guitar! This is now the album I’m going to be playing to correct someone next time they make an assertion shred guitar is just technique over melody, because this album proves that to be completely wrong. There’s more well crafted melody in here than I’ve heard in 90% of albums in the entire genre of rock, instrumental or not, so it’s not hard to see why this album is currently at the top of the sales charts on the sites that sell it right now. Shredaholic’s verdict? Go out and buy it now! update! we now have this CD in stock in the brand new Shredaholic store, go to www.shredaholic.com/shop.html to order a copy for yourself!